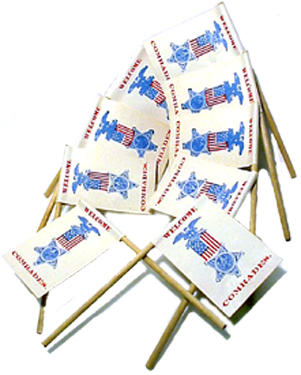 We have a small quantity of little paper stick flags nicely printed WELCOME COMRADE with the Grand Army of the Republic membership device. Originally used as handouts to welcome visiting members and attendees at encampments of the GAR, these neat little mementos measure 1 3/8” X 2” on a 4” stick and were worn in the lapel button hole. Quite fragile thus difficult to find today these were acquired from storage where they have been tucked away since the hay-day of the grand old Civil War Veterans organization. As found and all original, we offer them here priced individually for the collector who would like a nice original GAR item without spending a lot of money. please note: ALL ITEMS ARE CURRENT & AVAILABLE UNLESS MARKED SOLD!!. If you are new to our catalog and wish additional ordering information or just to learn who we are, please check out our home page. Thanks for visiting our catalog! !